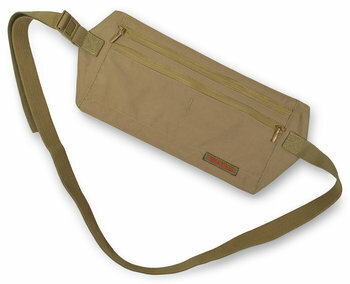 Civita Comfort: Made from the same ultra-soft polyester blend fabric as our Civita Day Pack, our sturdy, ultra-light, under-the-pants Civita Moneybelt is your best guarantee against pickpocket theft when worn just under the beltline. For Every Body: Its soft ¾-inch wide elastic strap measures 36 inches and stretches comfortably to 72 inches. Its slim, strong buckle makes it easy to clip on and off. Your Choice: Our Silk Moneybelt shares the same dimensions and features, but is made from comfortable spun silk. 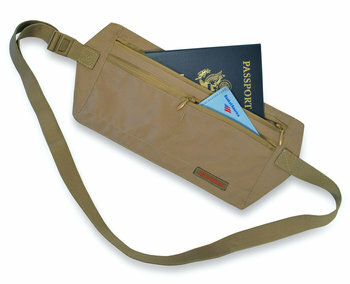 Or, go with our Civita Neck Wallet or Civita Hidden Pocket. Dimensions: 11" x 4 ¾"